Vacuum cleaning the easy way A central vacuum cleaner does just that. It is extremely quiet, odour free, lightweight and handy, turning a repetitive domestic chore into an agreeable easy-to-do job. With the central power unit (combined motor and dust container) stowed away on the loft, in the basement, or in some remote location where it bothers no one, it is out of the way, and the only thing you need to carry around when vacuuming is the hose itself. A clever precaution against asthma, eczema and other allergies as all dust pick up is directed out of the rooms through the sealed tubes. 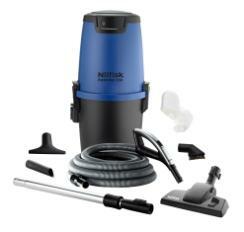 The ‘All-in-1’ boxes from Nilfisk contain everything you need for installation of a central vacuum cleaner in old houses as in new-build. Manual hose kit (depending on model): The central unit starts with the hose is connected to wall inlet and stops when removed. Deluxe wireless hose kit (depending on model) – wireless operation of central unit: Start/stop at handle, regulation through 5-speed / suction power levels, LCD info display with information on a a) Empty dust bag, b) Blocked airflow c) Issues that needs service d) Overheat indicator symbols if the power has become overheated. E) Signal indicator. Flashes if the bend end is our reach from the central unit f) Battery level of bend end.